Over 4 1/2 years ago, I posted a simplistic Loco Moco recipe on the blog that my buddies and I enjoyed together. Unfortunately, I was new to blogging at that time and for some reason the recipe was linked to a different blog and the page isn’t there anymore. I do remember the recipe being super basic and since I was uncomfortable making sauces from scratch, I opted to use jarred beef gravy for a no fail approach. 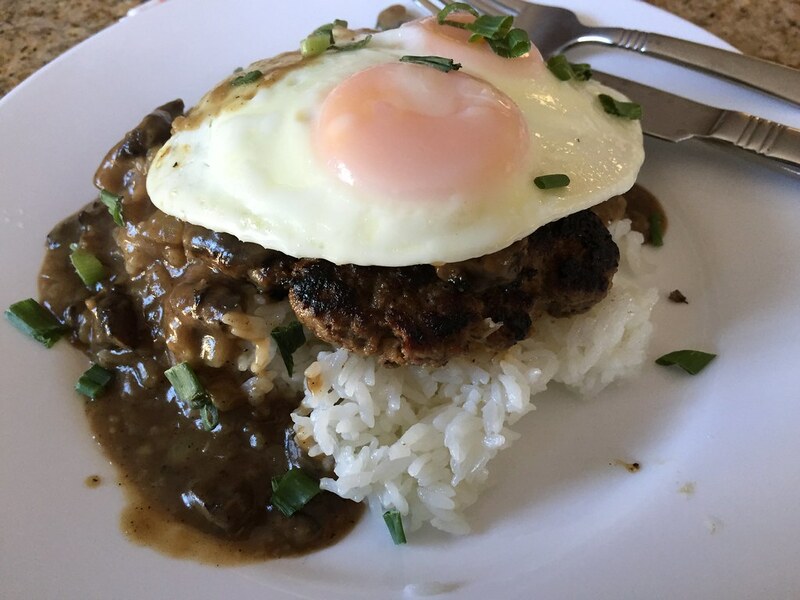 Since then, I’ve tried many Loco Moco variations locally and in Maui and Oahu while on family vacations and have used my Loco Moco experiences to construct what I call the Ultimate Loco Moco. In order to create the Ultimate Loco Moco…. First, the patty must be hand made. I’ve tried places that use frozen patties and the texture was rubbery and tasted no bueno! Second, the patty must be cooked on a cast iron skillet or a stainless steel skillet. These type of skillets form a crisp crust on each side of the patty adding crunchy texture and bursting flavor to the dish. Also, the fond, or brown bits formed on the bottom of the pan, is used to enhance the depth of flavor of the gravy. This is one of the main reasons why I fell in love with the patty at Hukilau in San Jose. Finally, there must be minced onions and mushrooms in the gravy. This enhances the overall flavor and taste of the gravy and makes it look a little fancier. This was how the gravy was prepared at Da Kitchen Cafe in Maui and I thought it was absolutely genius and perfect. Hamburger Steak – With your clean hands, mix ground beef, grated onions, Kosher salt, pepper, and Worcestershire sauce in a medium sized mixing bowl. Form four equal-sized patties. Heat a skillet (preferably cast iron) on high heat and cook patties on each side for 2-3 minutes. Mushroom Gravy – Once patties are removed from the pan, reduce heat to medium, add butter, and saute the mushrooms and onions for about 5 minutes. Add flour and continue cooking the flour turns brownish in color. Slowly whisk in beef broth, scrape up the fond, and let gravy simmer and reduce until it reaches the desired consistency. Fried Egg – Add vegetable oil and Heat frying pan to medium heat. When pan is hot, crack eggs, one at a time, into a small bowl and pour it into frying pan. Cover the pan with a lid for 3- 5 minutes until egg is cooked. Flip if necessary. Assembling Ultimate Loco Moco Plate – Add steamed white rice (1/2 cup or more) to a plate. Place hamburger steak patty on top of the rice and smother gravy over the patty and rice. Finally, top with fried egg and sprinkle with green onions if garnishing.